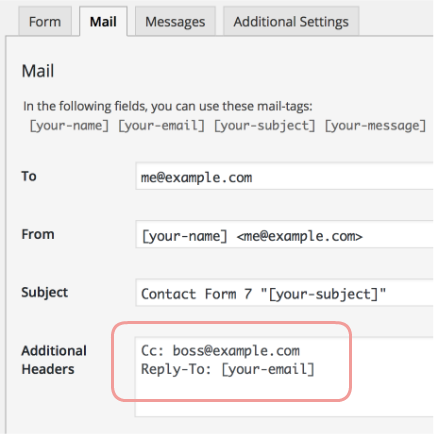 Contact Form 7 has setting fields for mail headers of To, From and Subject. Have you ever thought of adding Cc or Bcc headers to your mail? Additional Headers fields in the Mail and Mail (2) sections are just for that purpose. You can input any header lines into the field; and you can insert any mail tags into any place in each header line, just like other Mail fields.